The SHS Class of 1970 was one of the first to receive their diplomas along with a handshake from principal Bill Banks. 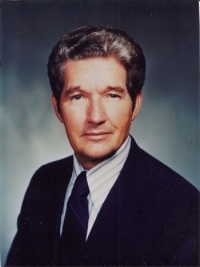 He served as principal of SHS from 1969-1980 and is remembered for his calm, congenial manner and his fairness. He was an advocate for students and teachers alike and earned the respect of both. Prior to moving into administrative leadership, Mr. Banks made his mark on Sarasota County Schools by pioneering the orchestra program in 1950 when he arrived in Sarasota after graduating from FSU. In his free time, he was a charter member of the West Coast Symphony and played the double bass with that local orchestra for 38 years. Prior to his appointment as principal of SHS, Mr. Banks taught orchestra at both Sarasota Junior High and Sarasota High for years and when he moved into admnistration, he maintained his passion for working with students and his sensitivity for education at the classroom level. When a new auditorium was built at SHS in 1994, it was dedicated to Mr. Banks and bears the name, the Wilmer C. “Bill” Banks Fine Arts Center. Mr. Banks was an avid fisherman and a family man. He is remembered as a man of integrity, patience, altruism, strong faith and steady leadership. He is missed.